Do you ever find yourself struggling with all the demands of motherhood? Wondering how you’ll make it through another day? 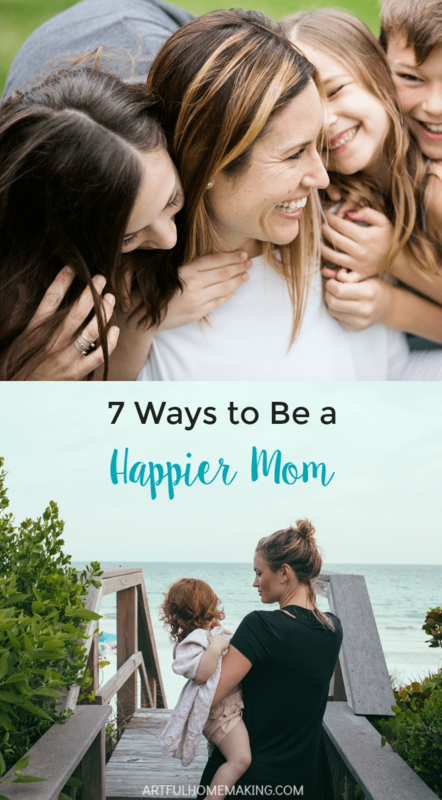 Here are 7 ways to be a happier mom. Some of these ideas just might help! Piles of laundry, sick children, and overbooked schedules are just a few scenarios that can cause a mom to feel discouraged. Perhaps you’ve reached a point of being constantly burned out and tired. 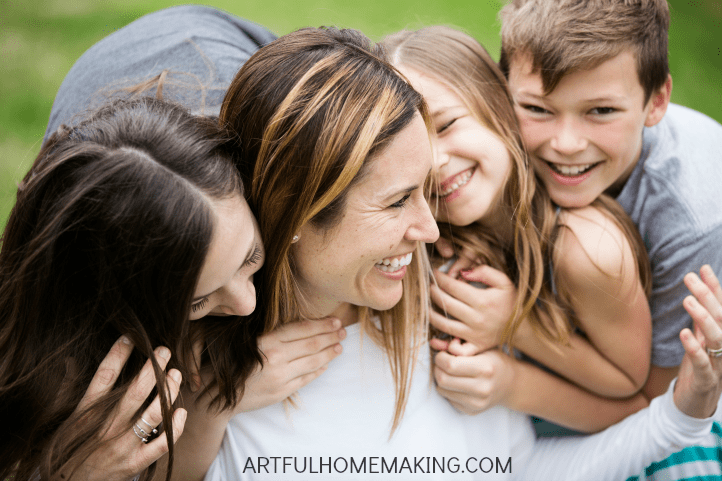 Whatever the reason for your unhappiness, here are 7 ways that a mom can get and maintain a happier mindset. Since God himself is the source of all happiness, it makes sense that a quest for greater happiness would begin with him. After all, he’s the creator of beautiful sunsets and flowers, oceans and animals, fireflies and stars and birds. He gave us the ability to taste and feel and enjoy his creation. 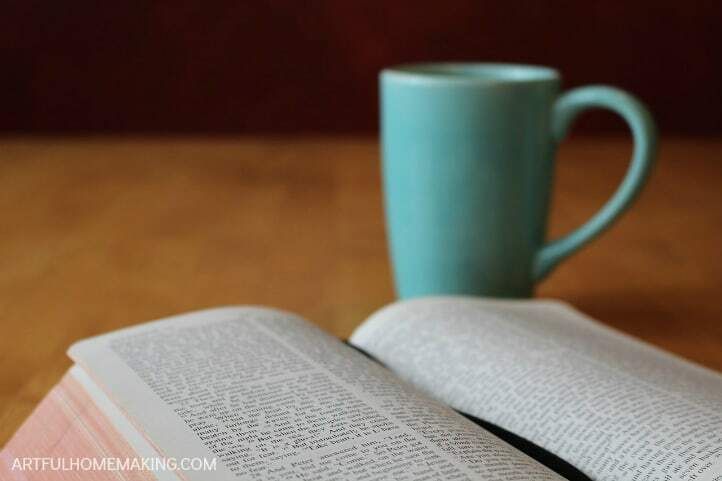 Make time in the Word of God a priority in your days. It doesn’t have to be in the morning, but that is often the best time. It’s so encouraging to start the day with truth in your heart and mind. When I’m feeling discouraged, I often feel drawn to pray. Prayer is a great stress reliever! Reading encouraging books can give you the help and encouragement to carry on! This book gave me a much-needed paradigm shift and helped me to realize how essential happiness is in the life of a Christian. 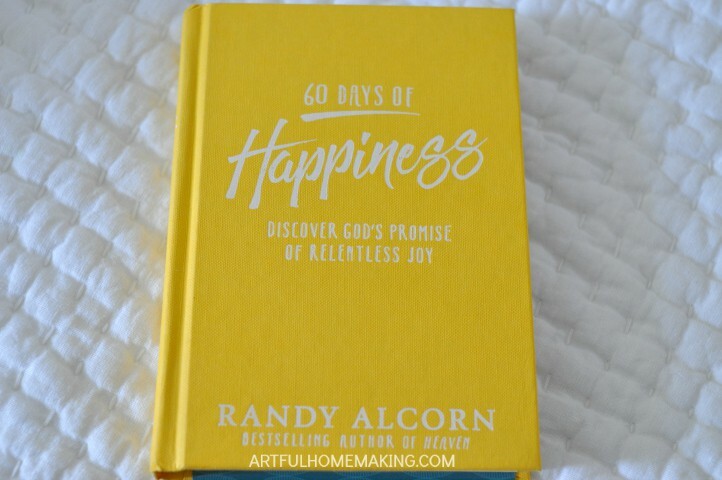 I’ve been reading Randy’s book on happiness as part of my morning devotion time (after reading the Bible), and I’ve enjoyed the short, encouraging chapters. So often moms struggle through their days because they’re not getting the rest they need. Make sure you’re getting enough sleep, and if you can’t get it at night (because of babies or small children waking you up), try to catch a nap in the afternoon! I don’t know what it is about being outside, but it’s often just what I need to lift my mood! 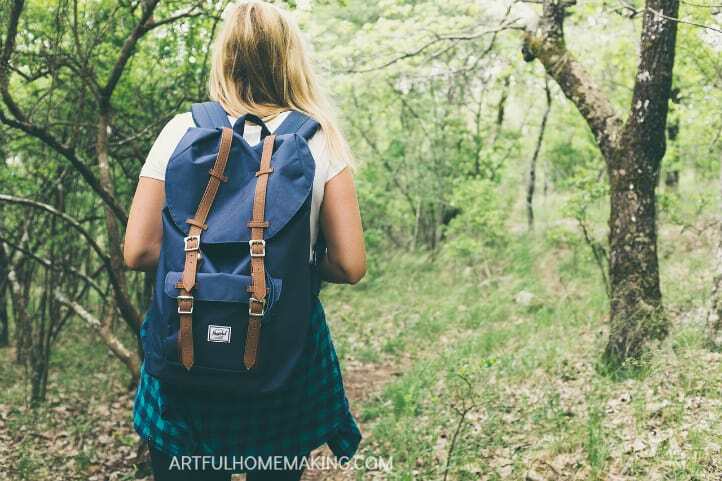 Take a walk, go to a nature center, or just play in the backyard with your kids. Sometimes we let ourselves get so run-down because we’re just trying to do too much. We pile on more projects than we can ever accomplish, and that stresses us out and discourages us. Learn to say no to others (and yourself, if necessary!) if something doesn’t fit your list of priorities or you just don’t have time for it. In addition to saying no to things that don’t really matter, we also need to say yes to those that do. Things like reading aloud to our children, serving our families through homemaking, and investing in our marriage—those are the things that will matter for eternity. Say yes to those things! Say yes to family times and celebration and laughter. Say yes to family traditions and nurturing relationships. May we as moms set aside excessive busyness and distraction, and instead say yes to what matters. Disclosure: This post contains affiliate links. I received the book above from Tyndale in exchange for an honest review. Read my full disclosure policy. Sharing here.